I've been seeing a fair amount of coyote lately, most likely because of dispersing young coyotes from this years litter, trying to make it on their own. That's another reason I love this time of year: autumn shakes things up and brings a lot of elusive animals into plain view. 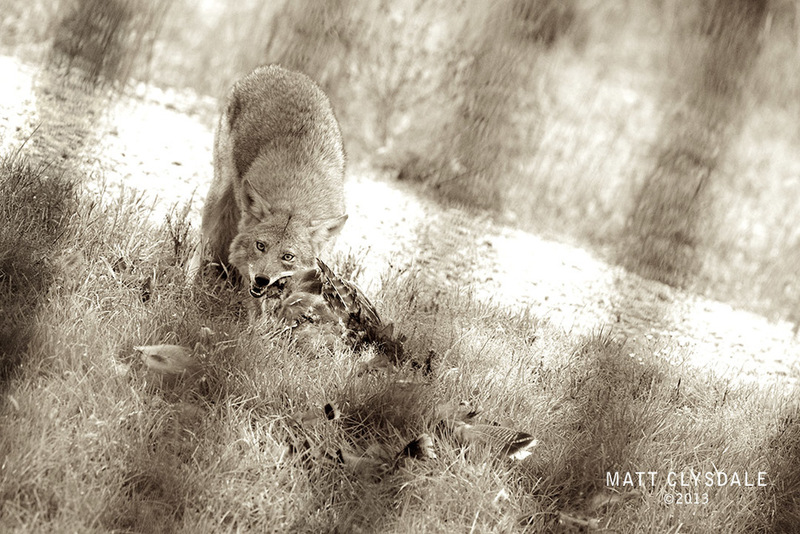 I spotted this yote chowing down on a turkey (most likely a youth from this years brood) inside the public safety training facility while I was leaving my house. I quickly raced back to get my camera and fortunately he was still going at it when I returned. The fence in-between us gave him just enough added security to stay long enough for a round of shots. Given the abundance of turkey all throughout the city (and state? ), there's really no harm in the yotes keeping the numbers in check. Coyote hunters use the same rationale to justify their hunting of yotes, but I'm not in that camp. I say we bring back the wolf and the cougar. That'll keep 'em in check; and make me a happy wildlife photographer.